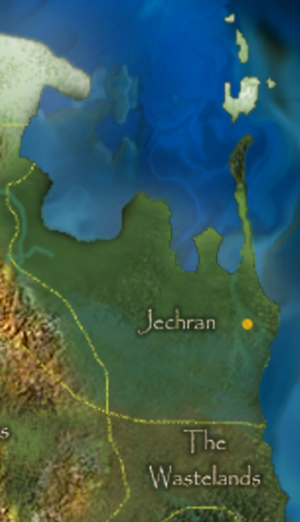 The nation of Jechran is a conglomerate of small tribes that recognize a central leader and area as a focal point. This country borders Galdos on its western side and the Wastelands to the south. Eastward is the great ocean. This arrangement has given the country a high degree of isolation, which accounts for its peculiar society. Jechran's western neighbor of Galdos is very mountainous, which causes a lot of rain to fall in the area. Jechran is located at a point on the continent where the weather is sharply divided down the middle of their country. To the south is a tropical forest, but north of the forest it turns into a more temperate, and slightly chilly climate. Moist air is lifted up high by the mountains of Galdos where it cools and loses its water as it sinks and passes over Jechran. This weather pattern is fueled further by the country's proximity to the sea. Thus Jechran can be quite rainy at times, and as a result, it is a lush and foggy land of forests, though not quite warm enough to support jungle life. Early on in his godhood, Mikon took on a wife named Yeraiah. Although she did not create a race for herself, Yeraiah took on some followers and helped them to survive in Jechran, the area they called home. Long before the Fairy War, Jechran was part of the original Orcish nation of Dobrekan. During this time period, the major inhabitants were Orcs; however, they were largely at peace with the humans and elves of the surrounding nations. A brisk trade made all sides prosper, and huge communities of humans and elves sprang up in the forests of the Orcish nation with the complete permission of the Orcs. Dwelling in the forest were small populations of fairies as well, both of the O'Ma and Titanian variety. When the Fairy War started, there were quite a few small skirmishes fought on the soils of Dobrekan, though it was never as devastating as elsewhere on Avlis, such as in the forests of T'Nanshi. Still, as the old stories relate, the Orcs decided to capitalize on the Fairy War by attempting to wipe out both fairy races at once in an effort to shift the tides of good and evil on Avlis more towards their liking. Some however, will relate that the Orcs did not like the fairies fighting on their soil, and when the Fairy War grew too large and became harder to contain, the Orcs rallied to defend themselves by attempting to expel both fairy races from their land. Whichever side was correct the Orcish fray into the Fairy War was what started the Great War. When the nations began to attack Dobrekan, the Orcs immediately started persecuting the Elven and human settlers within their lands, even though the humans' home nation of M'Chek was not yet involved. The Great War was the most devastating event ever to befall the world to date. Human and Elven males living within the nation of Dobrekan rallied to defend their homes and their families by joining with the other nations attacking the Orcs. This was considered to be a very large reason why the Orcs were forced to flee from Dobrekan altogether. Halfway through the Great War, Dobrekan ceased to exist. The Orcs were driven from the east coast all the way to the west coast where they were split into two groups that eventually became the Orcish nations of Brekon and Dubunat. The great carnage that went on throughout the Great War depleted the abandoned nation of both Orcs and males. Only the wives and mothers were left behind.... by the end of the war, they were mostly widows. Distraught, and living in an abandoned land with almost no guidance, the women were rallied by a young goddess who took pity on them. Her name was Dre'Ana, daughter of O'Ma. Dre'Ana taught the women how to hunt and care for themselves and each other. She taught them the ways of the forest that she learned from her father. She taught them of bows and swords, and self-defense. She taught them of life and organization. The Human and Elven women developed their society into a system of tribes. The few men that were left helped out as best they could, though as the tribes slowly developed, their power waned as their numbers increased slightly. Males soon became irrelevant to survival among the tribes, now known collectively as Jechran. The name Jechran was taken from a lizard in the area known as a Jechira. They are small and fast in their early life, but soon become great and powerful as they age. The nation of Jechran largely keeps to its own. Tribes will manage their own affairs and sometimes fight among themselves. Many tribes have a lesser queen, or an elder council of women. It generally varies from place to place, though most tribes hold the interests of the many before the few. Dre'Ana is the supreme leader of Jechran to whom they owe everything. The mortal center of Jechran where all tribes send their representation is in the settlement of Myleah. Dre'Ana's mortal agent presides their as the nominal leader of all the tribes of Jechran. Through independence, they remain unified. Jechran is a nation of female dominance, and thus males are relegated to a lesser role in society. From an early age they are trained to be subservient and keep out of the way of women's affairs. This is done for the good of the tribe, for Dre'Ana taught them how to survive and their skills are important. Each tribe only keeps a limited number of males. The number varies by tribe, but most males are allowed to live in small communal man quarters somewhere in the village from age 15 to age 35 (humans) or age 70 to 200 (elves). After this age, the males are usually casted out into the Wilderness. Unfortunately, since their lives are mostly spent indoors or doing village labor, they never learn how to survive in the wild forests of Jechran and they often become food for big prey like lions or Jechera. Women who become pregnant are afforded care by the tribe. They have developed many different kinds of teas and ointments that supposedly increase the chances of female births. These remedies are employed during times when there are sufficient males in the tribes. If a woman gives birth to a male child after the tribal limit has been reached, the tribe will often take the baby and seek to trade it to another tribe who happens to be low on males at the moment. The baby is given to the new tribe in return for whatever other goods the tribe wishes to trade for... food, livestock, clothing. In rare cases, the baby will have to be abandoned if another tribe is not found, but this does not occur too often. A male baby spends its early life with its mother learning the ways of its tribe. It does this until it is old enough to stay with the other males in the tribe and do its duty of reproduction. There is no marriage in Jechran society. Women who are intent on having a child will choose a male of their liking and procreate. Almost no consideration is given to human and elven distinctions. There are tribes that are largely human, and tribes that are largely elven, however they all follow the same precepts of female dominance and faith in Dre'Ana, who is herself a half-elf. Human babies are often traded to elven tribes, and vice versa. Consequently, Jechran has the highest concentration of hybrid human-elves in the whole world. Many tribes consist totally of halfelven women who have slowly mixed their blood over the past two millennia. This is not considered a bad thing among the tribes, because the most important concept is survival, not race. Race generally does not matter among the tribes of Jechran. For information on tribes of Jechran, see Category:Jechran. This page was last edited on 10 June 2016, at 20:21.